This is a quick test to see how much a thin layer of snow covering a part of a PV panel effects the output. In other words, should you bother to clean off the PV panels when they are only partly covered by a light snow? We had a snowstorm yesterday that covered all the panels with about an inch of snow. By mid morning today, the tops had cleared off, but the bottoms still had the inch of snow. Half of panels cleared, half with partial snow cover. The effect is pretty dramatic, the panels that were cleared of snow are producing nearly ten times as much power as the uncleared panels. So, I guess the moral is -- get out there and clean off those panels! Note - the reason that the panel report above does not show the 5 cleared panels on the left and the 5 snow covered panels on the right is that apparently the panel map I turned into Enphase had some panels in the wrong position -- have to send them a new map. Good to know as I have a very small off grid setup and wondered if my efforts in clearing it off mattered! I knew it would help but didn't know to this extent. Thanks! Maybe note that this applies only to microinverter setups. I believe people with typical single inverter setups will have very little output from their whole array when a few panels are still covered with snow. Here is a nice video from NJ on the topic of snow on panels on a roof. 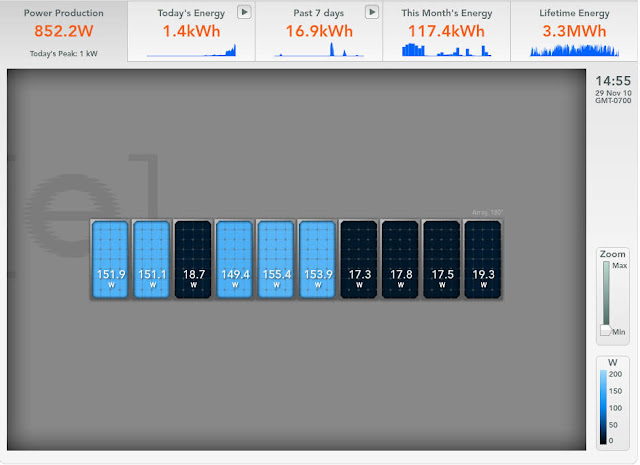 Also an enphase setup. Thanks Erik -- I'll add a link to that video.